There are many out there who enjoy the style and feel of older editions of D&D. While it's certainly possible to find these products on eBay and the like, you may not be aware of the concept of a retroclone. A retroclone is a game that is compatible with, and heavily based on, an unsupported game or unsupported edition of a game. 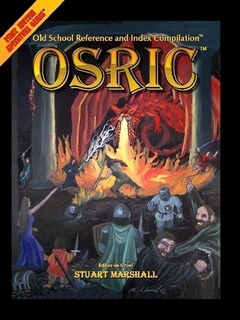 For example, OSRIC is a retroclone of Advanced Dungeons & Dragons 1E. These games take advantage of the fact that game rules are not covered by US copyright law and many use the Open Game License to take advantage of terms and text released under the 3.5 System Reference Document. Some retroclones are very faithful to the original rules; others attempt to capture the look or feel of the game while tweaking or modernising it. There are also games that are inspired by old school roleplaying in general rather than a particular game or edition. These might be called 'retro' games rather than retroclones. An example of a retro game that is not a retroclone is Old School Hack, a free download that won an ENnie this year. This article lists some retroclones and retro games. There's a lot of them out there, and so the article is not intended to be exhaustive; although free to add any others—it is a wiki page, after all. The point of the article is to show you ways to obtain and play old versions of D&D or games very similar to it. Thus I include Pathfinder as a current updated version of D&D 3.5, and the d20 SRD as a resource for d20/3E rules. I've marked the "cloniest of the clones" (i.e. the ones closest to the original systems) with little graphical tags, below. This doesn't mean they're better than the others, just that they are the most "clony". Swords & Wizardry Whitebox and Swords & Wizardry Core Rules (both from Mythmere Games) clone the original 1974 rules and the 1974 rules with some additional content, respectively. Both are covered by the Open Game License and are available as free PDFs and cheap soft and hardcover books from the Mythmere Games website. A collection of adventures, sourcebooks, and the like is also available from that site. Swords & Wizardry won a silver ENnie when it came out! Also, there is an S&W SRD here. Corruption focuses on challenge-based gameplay and support for step-by-step adventure- and campaign-building. The game is a Swords and Wizardry variant, but contains lots of new/ extra content that's useable with any Old School RPG system. Corruption also sets out options for rapidly shaping gameplay to offer gritty, heroic adventures – with a comic book ‘dark’ flavour. It's suitable for teenagers and adults - and very inexpensive. Renegade is a slimmed-down but full version of Corruption. The game is free to download and offers a straightforward take on the original rules, which is ideal for introducing new players to RPGs and delivering open-ended gameplay. Renegade adds to the basic clone recipe with a wide range of character classes, items and monsters drawn from many OGL sources. The content has been edited to keep the game family-friendly. This editing removes a few monsters and more destructive options that can cause some parents concern. Labyrinth Lord (Goblinoid Games) clones the 1981 (Moldvay) edition of D&D. It is covered by the Open Game License and is available as a free art-free PDF and cheap PDF and hardcopy with art from the Goblinoid Games website. Two additional supplements, Original Edition Characters and Advanced Edition Companion, replicate part of the original D&D and Advanced D&D 1E play experience. Adventurer Conquerer King System (Autarch) clones the 1981 Basic and Expert editions of D&D with expanded rules for the "end game," including domain management and spell research, and character customization via a lightweight skill system. It is 100% open game content (except for some terms relating to its implied campaign setting). The PDF is free with purchase of the hardcover (available at your FLGS or online through Game Salute); buying the PDF includes a coupon allowing its price to be deducted from the cost of the hardback.. Dark Dungeons (Gratis Games) clones the D&D Rules Cyclopedia (which was itself a compilation of the BECMI (Basic, Expert, Companion, Master, Immortal) sets. It is covered by the Open Game License and partially released into the public domain and is available as a free PDF and cheap hardcopy from the Gratis Games website. Two other games, Darker Dungeons and Darkest Dungeons are based on Dark Dungeons but are less faithful clones of the Rules Cyclopedia. OSRIC (Knights & Knaves) clones 1st Edition Advanced Dungeons & Dragons. It is very faithful to the original and was perhaps the first retroclone. It is covered by the Open Game License and is available free of charge as a PDF, or you can buy a big thick hardcover version or one with more art and better paper here. There are also dozens of adventures available for it, including a whole slew of them at RPGNow. For Gold & Glory (Fey Square) is a not-yet released clone of 2E; it's a "close adaption" of the three core rulebooks combined into one single book with errors corrected and minor updates. It is covered by the Open Game License, but at present only a preview version is available. The preview contains chapters 1–11: all the rules from the PHB and DMG, but not the spells, items, or monsters. Myth & Magic (New Haven Games) is a less 'clony' version which is built from the core of 2E but advances the mechanics. It is covered by the Open Game License, but the player's and GM's starter guides (taking you to 10th level) are available only to members of of the website. The Revised System Reference Document collects most of the rules of Dungeons & Dragons 3.5 and is available as RTFs, PDFs and on the Hypertext SRD. The Original System Reference Document collects most of the rules of Dungeons & Dragons 3.0 and is available as RTFs. Pathfinder (Paizo Publishing) is, of course, a major player in the RPG scene. You've probably heard of it! It's pretty much D&D 3.75 and is also covered by the Open Game License. It's well supported with sourcebooks and adventures, as well as a thriving third-party industry of smaller publishers. The Pathfinder Reference Document is maintained by Paizo Publishing; a more extensive Pathfinder System Reference Document is maintained by fans. Trailblazer (Bad Axe Games) is kind of a "fixed" 3.5 ruleset which addresses "most common 3.5 complaints" and adds stuff while streamlining other stuff. It is covered by the Open Game License. With the announcement of 5th edition, fans have begun to clone 4th edition Dungeons & Dragons. These clones can't be described as 'retro', since 4E is still the supported edition. All are either covered by the Open Game License or intended to be covered by the licence in the future. 4SRD is an RPG.net wiki project to clone 4E. D&D4.5 is a partial clone of 4E on Google Docs. Magic Sword is a project to improve upon 4E. The creator has left, and the project is now on infinite hold. Open4E is an RPG.net wiki project to clone 4E as a base for other projects. One way of looking at retroclones is the classification suggested by Dan Proctor and codified on the There's Dungeons Down Under blog: a broad category of neo-retro games which includes all games in the OSR, then two sub-categories of near clones (like Mutant Future) and retro-clones (like OSRIC). The two sub-categories overlap for games like Swords & Wizardry which are not faithful reproductions of the original game, but can be made faithful fairly easily. It's definitely worth checking out Old School Hack, a free ENnie-winning game inspired by OD&D. It's not so much a clone as retooled system, and is a version of Eric Provst's Red Box Hack, itself a re-imagining of Basic D&D and can be obtained from the same site. Old School Hack is covered by the Creative Commons Attribution-NonCommercial licence. Basic Fantasy Role Playing Game brands itself as an "old-school roleplaying game in the style of Moldvay and Cook" and can be found here. Free to download or with print versions for purchase, it's based loosely on the d20 rules, but rewritten in the style of older systems, it's largely compatible with the Basic and Expert sets from the early 80s, although with some notable differences. It is covered by the Open Game License. Castles & Crusades (Troll Lord Games) is 1E reimagined with 3E rules, but it feels very similar. It is covered by the Open Game License and is well supported. There are free quick-start rules, or you can buy the actual game. Lamentations of the Flame Princess is compatible with many of the above clones and is a kinda fantasy-horror standalone game (think Wells, Poe, Lovecraft). It is covered by the Open Game License. Mutant Future is a retroclone inspired by Gamma World but using the rules of Labyrinth Lord. It is covered by the Open Game License. Stars Without Number from Sine Nomine Publishing is more inspired by or influenced by old-school games, and is a sci-fi game. There are more. If you're interested in a more detailed list, I'd suggest checking out this web page which seems fairly comprehensive. You could also check out websites such as OSR Gaming, or Dragonsfoot. A list of retroclones under public copyright licences is available at FOSsil Bank. "Cloniest of the clones", a phrase too cool to pass up, coined by @JeffB . You say "If you're a fan of 3E, you can probably still get the core rulebooks quite easily - they're not that old." That doesn't reflect Amazon; Amazon has used 3.5 PHBs starting at $26.45. It's been a couple years, but I saw a game store put a $40 tag on their 3.5 PHB. 3.0 PHBs start at $3.25, admittedly, but second edition starts at $6.87, and first edition at $2.00. In all cases, there's dozens of used copies for sale. D&D (as opposed to AD&D) is harder to find on Amazon (as in, my searches didn't turn the books for sale), and I suspect more expensive. So 3.5 is going to be a bit pricy to get the core rulebooks, but AD&D is quite easy to get a hold of. Ebay has loads of them much cheaper than that. They've had core rules out for a while now, and have a monster book coming down the pipe with Kickstarter funding getting it going. It's still true that many other editions are equally easy to find at negligible prices. For clarity: Mutant Future is *NOT* a retro-clone is Gamma World. It is more "Gamma World by way of Labyrinth Lord". It is a great game and lots of fun, but if you are looking for a true retro-clone, it doesn't quite qualify. That said, I love MF and recommend it to anyone who loves old school GW. Wow, actually a couple I didn't know about. Thanks! Hi Morrus! Thought I'd mention that Swords & Wizardry also got an ENnie Award when it came out (silver, in the Best Free RPG category). Edit: Oops, also it's maybe worth mentioning that Swords & Wizardry is picked up by a couple of better known publishers than my own hobbyist efforts: Necromancer Games has done the collected Tome of Horrors in a Swords & Wizardry version (in addition to the Pathfinder one), and Frog God Games (Bill Webb's Necromancer Games successor) publishes a set of Complete Swords & Wizardry Rules covering OD&D with all the supplements, essentially the AD&D that was supplanted by AD&D itself. Plus a whole bunch of modules from Frog God Games. Morrus When I click on the link to the OSRIC site, my antivirus software goes crazy and block the site saying "Malicious Web Site Blocked " . I'm not sure if it's just me, but I thought everyone should be aware of the possibility. I don't get that. But not much I can do about the OSRIC site! I'm not sure it qualifies as a retro clone, but Hackmaster 4E certainly should get a mention in this sort of article. Legends & Labyrinths: Takes 3E and strips it down to its most basic components. It removes everything non-essential, leaving behind a simple, fast-and-loose, easy-to-use system that remains 100% compatible with the advanced rules you're familiar with. CLIMB INTO YOUR LABYRINTH AND FORGE YOUR LEGEND TODAY! Labyrinth Lord received Honorable Mention in the Best Game category of the 2010 Ennies, which was very exciting especially due to the stiff competition in that category! That's a known issue with Norton AV; other AV software doesn't have problem with the site. @Morrus: thanks for the mention of Black Blade's version of OSRIC. I don't know if you missed this or omitted this because it isn't quite retro-cloney, but you have a section that includes LotFP:WFR, so I'd thought I'd mention Adventures Dark & Deep, an attempt to present a Gygaxian 2nd edition based on the notes from early dragons and conversations with Gary Gygax on EN World and other forums. Engines & Empires, a gaslamp or stempunk setting for Labyrinth Lord (or Dark Dungeons). Retro Phaze, a faux-clone inspired by OD&D and 8-bit console games. I've linked your helpful post to my Free Gaming page. Don't forget Mazes and Minotaurs which is a re-imagined ODnD on a concept of "What-If-DnD-Was-Based-On-Greek-Mythology". The website for For Gold & Glory has been down for more than a week. Does anyone know what's up?